Make The Best Use Of Your Limited Space With This L-Shaped Loft-Bed in Unfinished 100% Solid Premium Douglas Fir. 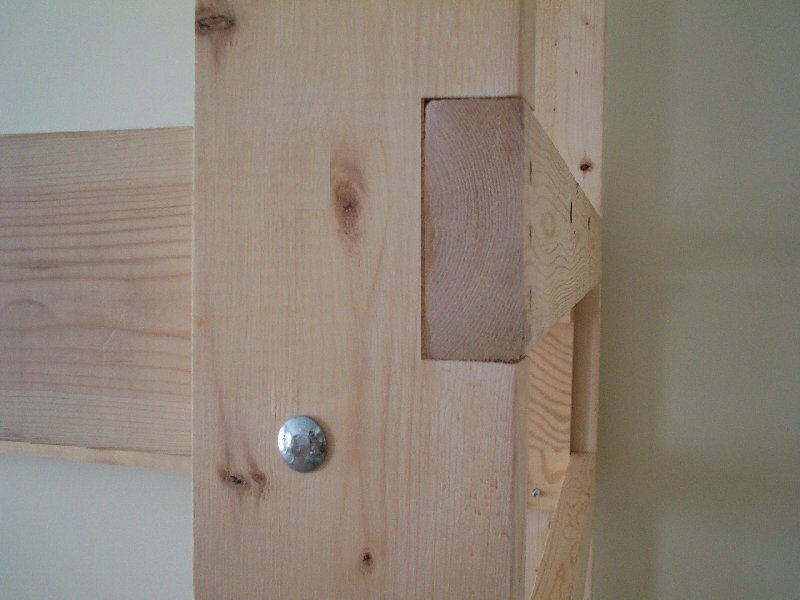 All Rails And Ladder Rungs are made of 2 ft. x 4 ft Premium Douglas Fir. 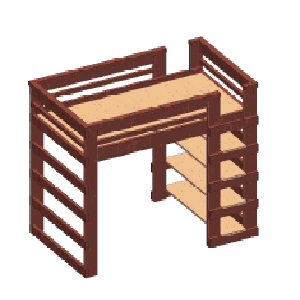 The Entire L-Shaped Loft-Bed Is a freestanding Loft-Bed That Comes As A Ready To Assemble Kit. Lifetime Warranty. Fully insured and Bonded. (Most Other Companies Are Not). Proud to be American Made. We have been in business for 20 awesome years. Bonus Feature, shipped fully sanded (Others Sell It To You Unsanded) ready for paint or stain. 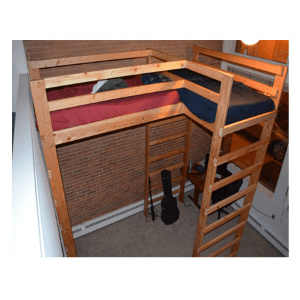 This L-Shaped Loft-Bed Is Available In Twin, Full And Queen Widths; And Regular, Extra Long (Typical College Size) And Dorm XXL Lengths, And Meet Most College Requirements. If you choose to purchase a particular size all of the beds will be the size that you purchase. You can also choose to mix and match the sizes. The complete Bed Frame has a weight capacity of 1000 lbs. There Are Two Leg Heights Available, The Regular 69 In. Or The Extra Tall 83.5 In. Legs. We assume you will use an 8 In. Mattress which will give you a clearance of about 55 In. for the 69 In. Leg or 67 In. for the 83 In. Legs. If you need more clearance you would need to use a thinner mattress and let us know the size. Give This L-Shaped Loft-Bed Superior Support And Stability. The Integrated (Notched) Ladders At Both Ends Enable You To Position The Loft-Bed In Any Corner And Will Give You Full Access To The Front Of The Loft. Personalize Your Space Under The Loft To Store Your Desk, Sofa Or TV. 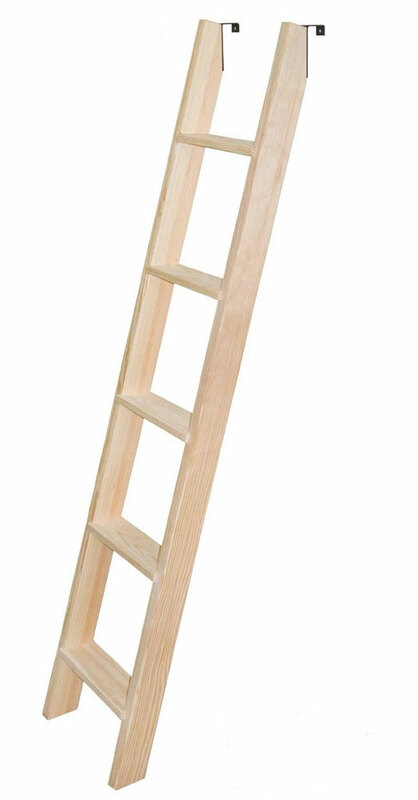 A Front Ladder Are Also Available. 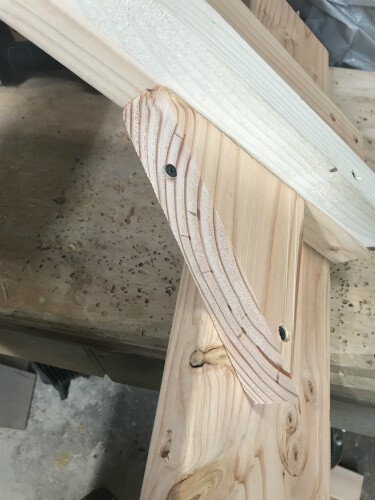 For Youths Under 13 Years Of Age We Recommend The Use Of The Youth Safety Rail Upgrade, Shown In The Picture (The Standard Loft Has Only One Safety Rail On The Front Side Of The Loft). *Mattress are Not Included In The Price. The Price Includes: Pre-cut & Pre-drilled Unfinished Wood, Integrated Left/Right Ladders, Front/Back Rails,1-Safety Rail per bed. ; Nuts, Bolts, Screws, And Instructions. Price includes 4-Bunkie Slats per bed. The price, shown, is for Two L-Shaped Loft Beds. You can choose to add more beds by choosing the options below. Please Scroll Down And Check Related Items For Important And Detailed Information On The Loft Accessories Such As The Bookshelves, Ladder, And Youth Safety Rails. Please Contact Us If You Would Like A Custom Height Or Length. We Offer Discounts For Large Quantity Purchases. ** Approximate Assembly Time: 30-40 minutes. ** NO chemicals, preservatives, etc. 100 % clean, natural solid wood. ** You can stain/finish it to your liking, or leave it as is. The upper level should not be used by children under the age of 6. The safety rails must be in use at all times! The staircase is an optional item that is not included in the price and can be purchase separately below. The Bed can be made any way you like. We can make it as a Two Bunk Beds, One Loft Bed and One Bunk Bed or Two Loft Beds. The price is for One Loft Bed and One Bunk Bed. We can also make the Bottom Bed a Full Size Futon on One Side Or Two. We can also make it as a loft bed only. The complete length of the regular bed for Twin Size is 120 in. Full Size is 135 in. Queen Size is 150 in. Click(Here)For Color ChartPlease enter the Stain Color of your Bed. Click below for information about our Stains. We can apply a coat of Mineral Oil to the bed to protect and bring out the natural color.To indicate your choice of color, please enter it in the comment section at checkout. * The Desk Top Can Be Placed Under The Bed Or At The End Of The Bed. (For Bunks) Bottom Bed To Be On The Flr. Make The Best Use Of Your Limited Space With our Custom Made Triple-Bunk-Bed with an L Shape middle bunk. In Unfinished Premium Douglas Fir.